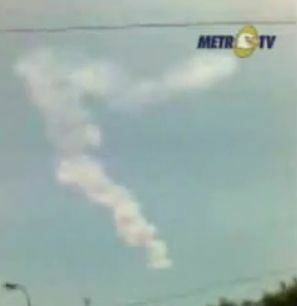 This still from an Indonesian newscast shows the remains of an asteroid explosion over Indonesia as seen by an amateur videographer. This story was updated at 4:50 p.m. EDT. GOLDEN,Colo. ? A space rock explosion earlier thismonth over an island region of Indonesia is now being viewed as perhaps thebiggest object to tangle with the Earth in more than a decade. On Oct. 8,reports from Indonesia told of a loud air blast around 11 a.m. local time. Onereport indicated a bright fireball, accompanied by an explosion and lingeringdust cloud, as the origin of the air blast. Accordingto experts at the NASA/JPL Near-Earth Object Program Office in Pasadena,Calif. ? Don Yeomans, Paul Chodas, Steve Chesley ? the blast is thought tobe due to the atmospheric entryof an asteroid more than 30 feet (10 meters) in diameter. Due toatmospheric pressure, the object is thought to have detonated in theatmosphere, yielding an energy release of about 50 kilotons (the equivalent of110,000,000 pounds of TNT explosives). ?Myunderstanding is that this may have been the largest object to strike the Earthsince the fireball near the Marshall Islands in the South Pacific on February1, 1994,? said Clark Chapman, a noted specialist in asteroids and a planetaryscientist at the Southwest Research Institute (SwRI) in Boulder,Colo. ?Although theIndonesian object was large and the resulting atmosphericexplosion may have been the equivalent of several Hiroshima bombs, it isnot unexpected for our planet to be hit every decade or so by such an object,?Chapman told SPACE.com. Apreliminary look at the incident has been performed by Canadian researchers PeterBrown and graduate student Elizabeth Silber, of the Meteor Infrasound group inthe department of Physics and Astronomy at the University of Western Ontario inLondon, Ontario. The researchers made a detailedexamination of all International Monitoring System infrasound stationsof the Comprehensive Nuclear-Test-Ban Treaty Organization (CTBTO). An initiallook found that a total of 11 stations showed probable signals from a largeexplosion. Based ontheir scrutiny of the infrasound records, the Canadian research team reported thata large (40-50 kilotons of TNT) bolide detonation occurred near the coastalcity of Bone in South Sulawesi, Indonesia. The infrasonic geolocation is notprecise enough to determine if the bolide was over water or land, but it wasrelatively near the coast, the team reported. Follow-onobservations from other instruments or ground recovery efforts, the Canadianteam added, would be very valuable in further refining this unique event. Theiranalysis corresponds to an object some 16-33 feet (5-10 meters) in diameter.Based on the earlier work by Brown, such objects are expected to impact theEarth on average every two to 12 years. ?We aretrying to coordinate with some local scientists to secure more local data, butthat will likely take several weeks,? Brown told SPACE.com. Brown saida YouTubevideo that was aired a few days after theevent convinced them it was a bolide. ?Had thishappened over the ocean we would only have known that there had been a bigexplosion?we would presume it was a fireball, but it could be anythingproducing a large impulsive shock in the atmosphere,? Brown said. More datais expected from U.S. military space assets that likely detected the event.From their vantage point in space, multiple sensor systems would have seen thehuge explosion and there surely is a rich dataset of measurements to be plumbedrelating to the detonation. Why wasn?tthis asteroid observed before it hit? SwRI?sChapman said he was not aware that the object was seen before it plowed intoEarth?s atmosphere. ?The bodywas large enough that some of the current Spaceguard Survey telescopes mighthave detected it a couple of days before it hit, were it coming from the nightsky. But it struck during daytime and probably could not have been seen bythose telescopes,? Chapman explained. A second question is whether it was detected by military satellites that monitorbright flashes in the Earth?s atmosphere for defense and security purposes. ?Almostcertainly it was detected and presumably immediately identified as an explosionof a large meteoroid rather than, say, an explosion of a human-made device inthe atmosphere,? Chapman figures. ?But these satellites are secret and, inthe past, the establishments controlling them have delayed releasing the data,for weeks or months.? Earlierthis year, Chapman added, a change in previous policy led the U.S. military to withholdthe data from the public. ?Scientistshope that they will reverse that policy. This event will demonstratewhether the wall of secrecy is coming down again, or not,? Chapman noted. ?Evidently,because of the passage of weeks since the event, there has been no decision torelease the data promptly.? LeonardDavid has been reporting on the space industry for more than four decades. Heis past editor-in-chief of the National Space Society's Ad Astra and SpaceWorld magazines and has written for SPACE.com since 1999.